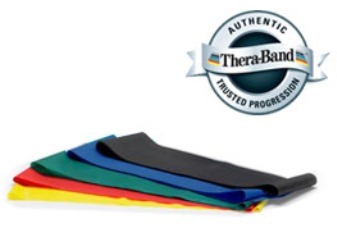 Thera-Band® Pre-Cut LATEX FREE Exercise Bands are are great for developing strength and endurance. A small percentage of people have an allergic reaction to latex material and/or the addition of powdered latex to other bands. 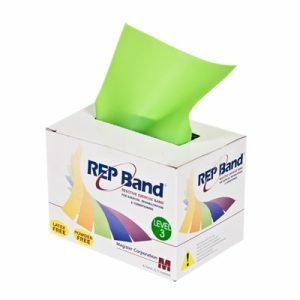 Thera-Band® latex free bands, made of a synthetic elastomer, have been created to allow users the benefits of resistance bands without the potential for an allergic reaction . 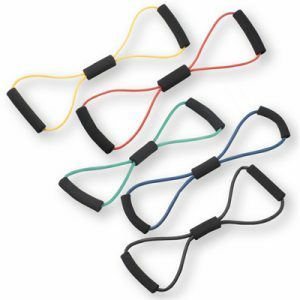 You can pick from 4 lengths 3′, 4′ 5′ or 6′ and 6 resistance levels. 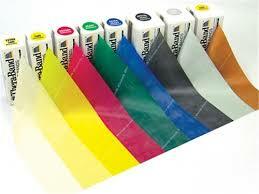 Elastic resistance bands and tubing can last for a very long time with proper care and use. Thera-Band elastic bands and tubing have been tested at over 10,000 repetitions without any breakage. The force produced by bands and tubing is directly related to elongation. Each color will provide a specific amount of resistance at the same percentage elongation, regardless of initial resting length. For example, a 1-foot piece stretched to 2-feet (100% elongation) will have the same force as a 2-foot piece of the same color stretched to 4-feet. Each band comes in their own bag. 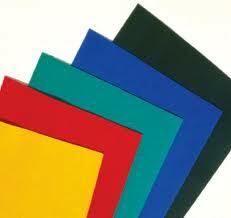 Sets of Pre-cut Thera-Bands contain 1 each of yellow, red, green, blue & black. Thera-Band ® warranty is at the manufacturer’s discretion.